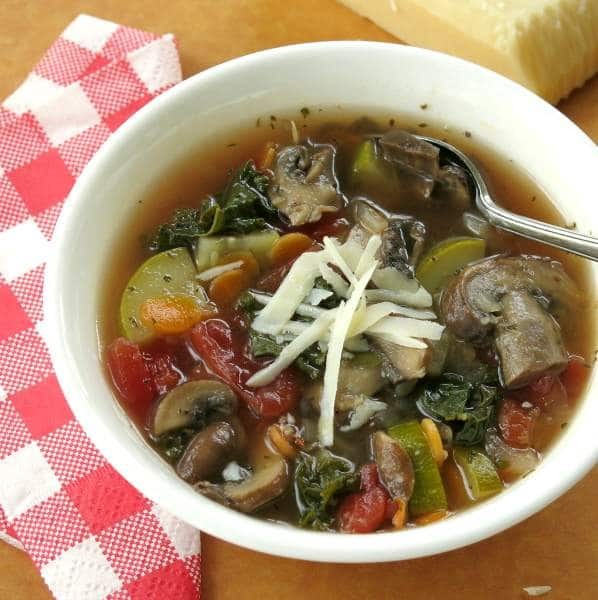 We’ll show you how to make hearty Homemade Vegetable Soup that is totally CRAVE-WORTHY. Crowd your diet with this clean-eating, healthy recipe to keep your diet on track and detoxify! We have tips for serving and freezing too! 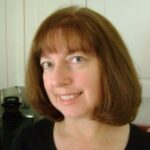 As I prepared a recent batch, I thought about how my thinking has evolved. My philosophy used to be the quicker the preparation, the better. That thinking often lead to frozen or canned vegetables, not that there is anything wrong that. But, I’ve taken these shortcuts before and I’m always a little disappointed. This is not one of those. This is the best vegetable soup I’ve ever had! Really. 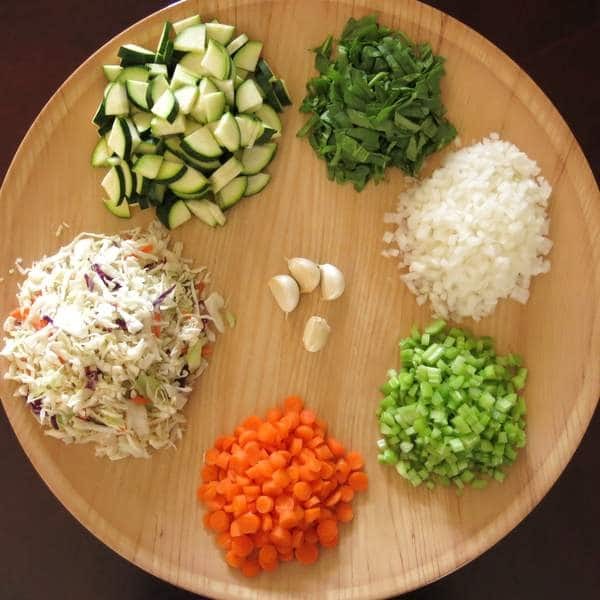 In order to create a homemade vegetable soup that you actually crave (and don’t just eat because you’re on a diet,) you need fresh ingredients. 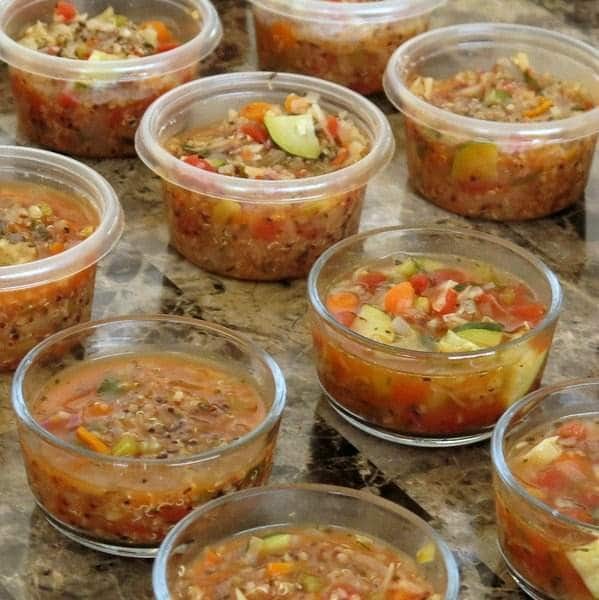 This recipe is packed with A LOT of veggies, which is why it goes by hearty vegetable soup at my house. Making this soup has become a somewhat meditative experience, from the trip to the produce stand to buy the ingredients…to chopping every last vegetable. It’s the same kind of experience you making Vegetable Rice Pilaf which can also be made ahead of time and frozen. When I make it, I go big and always double the recipe and freeze individual portions. Then, I can alternate between this soup, Tomato Florentine Soup and seasonal favorites like Spicy Butternut Squash Soup. More on freezing below too. I will have tasty soup in the freezer for the next few weeks. This recipe is easily adjusted for almost any vegetable, so you shop seasonal or adjust based upon personal preferences. Asparagus, green beans, squash, potatoes and different types of mushrooms are all options. I adore mushrooms, but my daughter does not so I make one batch with and one without. The only exception I often make to fresh is a can of diced tomato. I just don’t have the patience to chop tomatoes. Plus, I like to try some of the specially seasoned ones. Lately, I’ve been on a fire-roasted tomato kick. At this point is important to mention the herbs and seasoning. I try to go fresh. And, if you have been following my herb growing progress, I am happy to report that they are alive and well. 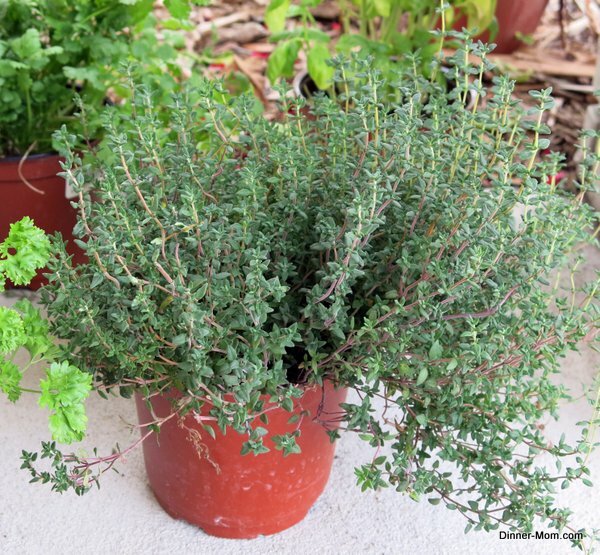 I add 1 Tablespoon fresh thyme, about 1/4 cup fresh basil leaves and 2 garlic cloves minced. HOWEVER, this soup is equally delicious with dried spices. Salt. As much as I would like to leave this ingredient out, I have to add a 1/4 to 1/2 teaspoon of salt. I use organic vegetable broth. Depending upon the type of broth used, the amount of salt added should be adjusted up or down. The next step is to soften the vegetables. Saute heartier vegetables for 5 minutes in a little olive oil. Next, add the more delicate vegetables and saute for about 5 minutes more. Don’t cut this step short. It really brings out the flavor! Finally, add the broth and spices. Bring the soup to a soft boil, reduce the heat and simmer for about 20 minutes. Add fresh chopped baby spinach leaves towards the end of the cook process. Simmering melds the flavors together. Honestly, I think it is even better the next day. Vegetable soup freezes beautifully. Freeze it in portions that make sense for your family. Shown are 1 cup containers. I also like to freeze a few 2 cup portions that are destined to turn into a meal. When you are ready to enjoy the soup, remove the container from the freezer and reheat in the microwave or on the stove-top. When reheating in the microwave, be careful with glass containers because they usually should not good from one extreme temperature to another. It’s best to move to the refrigerator overnight to defrost. When microwaving, heat in small time increments, stirring in between. This is where it gets interesting. 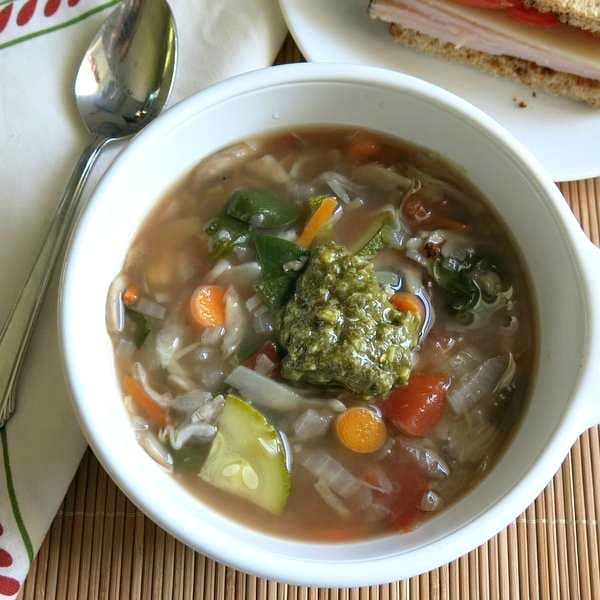 Although this homemade vegetable soup recipe is delicious all on its own. It’s fun to switch things up. Here are some favorite topping ideas. Just before bringing the soup to a boil, add 1/2 cup of quinoa. This is the process used for Black Bean Quinoa Soup and Sweet Potato Black Bean Chili. 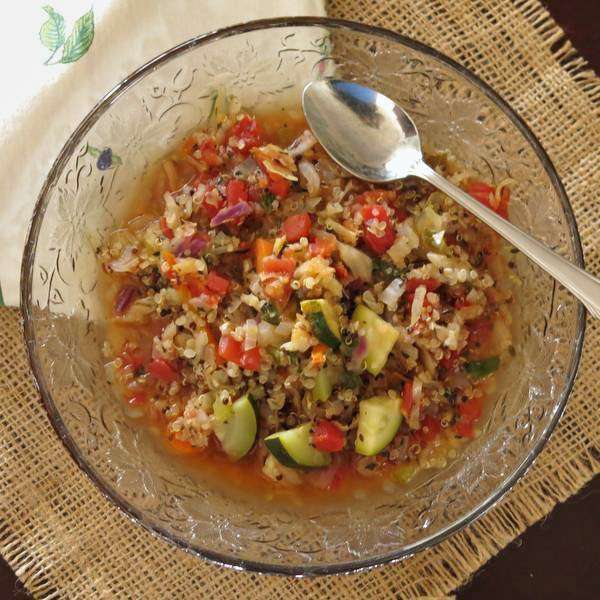 It’s a super easy way to add more substance, particular for a vegan vegetable soup. 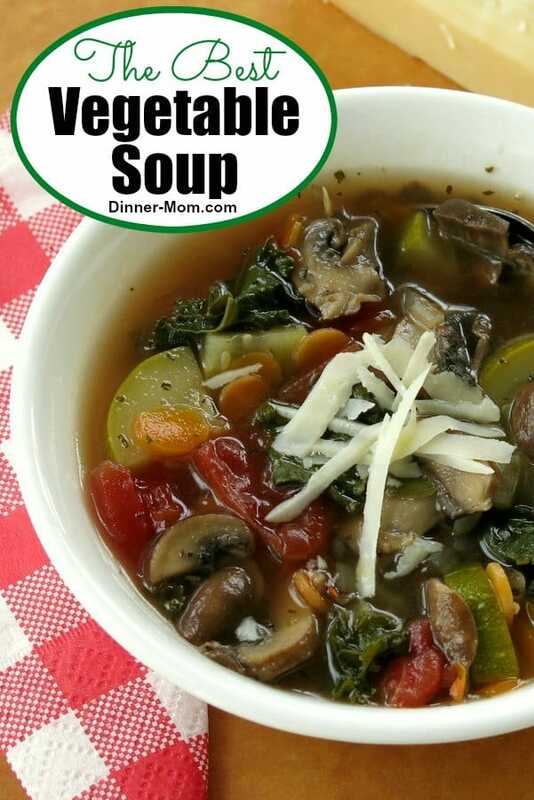 Add freshly grated Parmesan cheese and the soup becomes a creamy vegetable soup. A fancier option is to top with Parmesan Cheese Crisps. When you add in rice, beans or seafood…it’s a meal. It’s like a blank palate ready for a new artistic interpretation. 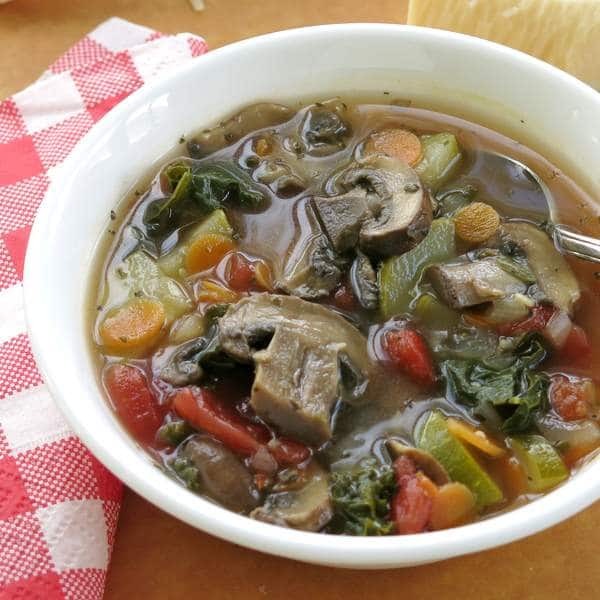 How will you enjoy your vegetable soup? 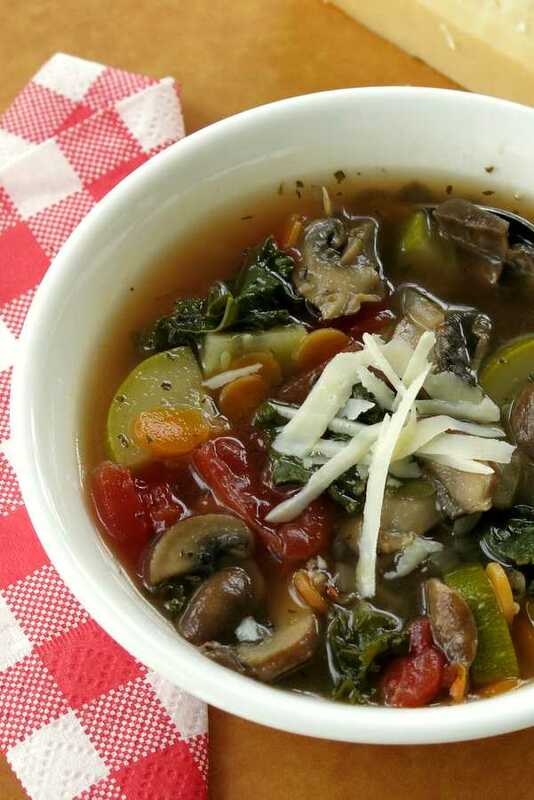 This Homemade Vegetable Soup is crave-worthy. Crowd your diet with this clean-eating, healthy recipe to keep diet goals and detoxify! Add onions, cabbage, garlic and saute until tender, about 5 minutes. Add zucchini, carrots, mushrooms and saute for 5 minutes. Bring soup to a boil, reduce heat to low and simmer for about 20 minutes. Add spinach about 5 minutes before end of cook time. Top with Parmesan cheese, pesto or protein, as desired. Substitute or add seasonal vegetables and favorites such as celery, asparagus, beans, potatoes and squash. Store leftovers in freezer. When you are ready to enjoy the soup, microwave from frozen for 1-2 minutes, stirring halfway through. I’m an instagram follower and have seen your posts on the batches you make on the weekend. Finally tried it and am hooked too! LOL.